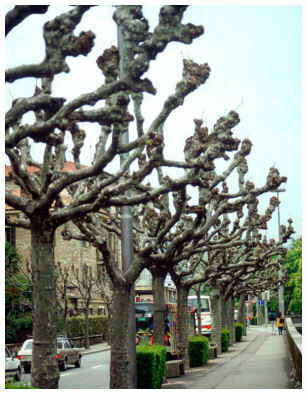 A method of pruning that can obtain regulation of size and shape is called pollarding or high coppicing. If this is to be done correctly the size and shape will be determined when the tree is young. A young tree is a tree that is 100% dynamic mass and the tree has a cortex that runs along the entire trunk. There are three basic types of frameworks, i.e., [A] single stems [B] [C] multi-stems. Every year once we establish the framework, we cut back all sprouts to the framework each year. When we want flowers, a few sprouts with flower buds can be left on the framework. The key to this practice is to establish the frame work when the tree is young. Continue to cut all sprouts back each year unless a few are left for flowers. One key is not to injure the swollen areas (branch collars) at the base of the branch when we establish the framework. The other key is that when we cut back the sprouts to the framework, we cut back to the swollen area at the base of the sprout but DO NOT injure the swollen area. This is an ancient art form. They have called many tree mutilations pollarding. TOPPING LARGE TREES IS NOT POLLARDING AND IS A DISADVANTAGE TO THE ENVIRONMENT! Here is multi-stemmed pollards by the Swiss.